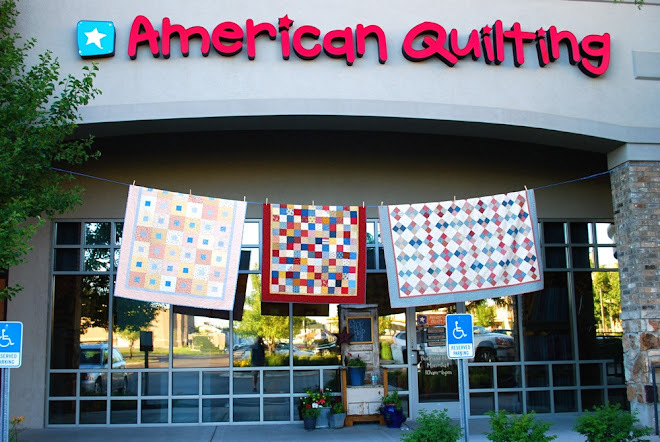 AmericanQuilting: Lots of new stuff at AQ! Lots of new stuff at AQ! at American Quilting this month! from French General for Moda. Finished quilts measure 74" x 92". Pattern is included with the quilt and costs $95. the Bar Harbor collection for Moda. The quilt measures 56" x 72". The kit costs $70 and includes the pattern. This cute little baby quilt is called Made in the Shade. It measures 42" x 42". All squares are pre-cut and pre-assembled in labeled rows. Includes everything but the back. (Requires 1 1/4 yard) Kit costs $40. Also a reminder: our new summer class lists are now available in the store! If you are interested in ordering any kits, call the store: 801-802-7841.